There are several conditions that cause thinning hair or hair loss. The medical term for hair loss is “alopecia,” and the most common type is called androgenetic alopecia, which most people call male or female pattern hair loss. Telogen effluvium is the second most common type. This condition is related to the hair growth cycle. There are three stages of hair growth and telogen effluvium represents the final stage where hair falls out. The third most common type of hair loss is called alopecia areata. It’s an autoimmune skin disease which causes the body’s immune system to attack healthy hair. RHRLI would like you to know about this condition that affects nearly 7 million Americans and 147 million people worldwide. We’ll tell you about the symptoms of this condition and how it can drastically affect the lives of those who are afflicted by it. According to the National Alopecia Areata Foundation (NAAF), the condition starts when white blood cells mistakenly attack susceptible hair follicles. This causes the follicles to become very small and it drastically slows down hair growth. Alopecia Areata can strike at any point in life but often starts in childhood, according to the National Institutes of Health (NIH). There’s a slightly increased risk of having the condition if a close family member has it. Children who develop alopecia areata before puberty are most at risk of developing extensive and persistent hair loss, according to the American Hair Loss Association, (AHLA) website. As per the NAAF, alopecia areata can strike suddenly, most often on the scalp, but hair loss can occur around the facial area or any part of the body where hair grows. Some people only lose patches of hair, while others can lose all hair on their scalp. There are no visible signs of the condition other than the hair loss. There are no signs of redness or inflammation, according to AHLA. The condition is not painful, nor is it disabling. There’s a lot that we don’t know about Alopecia Areata. We don’t yet know what causes it and unfortunately, there’s no known cure. One bright spot for those affected with the condition is that it often isn’t permanent. Despite the hair loss, the follicles remain alive, according to NAAF. Hair regrowth can occur even if the patient doesn’t seek any type of treatment. But hair loss and hair regrowth are unpredictable. Hair regrowth may occur after many years, or it may not occur at all. The cycle of hair loss followed by regrowth can repeat continually. 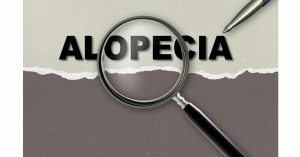 According to AHLA, about 30 percent of those with Alopecia Areata find that the condition persists or that they continually lose and regrow hair. Living with Alopecia Areata can be difficult from an emotional standpoint. Patients are known to wear wigs and scarves to protect their scalp. They also have to be careful about exposure to the sun by taking precautions such as sunglasses and sunscreen. The NAAF sponsors support groups for people with Alopecia Areata. There is no treatment that cures the condition. Many treatments available are designed to help stimulate hair regrowth. They include things like cortisone injections, minoxidil or other creams and ointments. If you are concerned about severe Alopecia Areata or if you’re looking for a permanent solution to hair loss or thinning hair, RHRLI can provide you with solutions. We are the only hair treatment center on Long Island that uses the ARTAS® Robotic Hair Transplant System. Medications like minoxidil don’t provide a permanent solution to hair loss, while other options like painful surgical techniques or transplant systems from doctors using handheld devices aren’t as accurate. The ARTAS® System will leave you with a full and healthy head of hair. To get started, contact us today.